Would you like to send this to a friend? Staging Diva Dispatch, written by home staging expert Debra Gould, is a monthly newsletter filled with real estate staging business tips and articles for aspiring and established home stagers. The Staging Diva shares practical solutions and ideas to help you decorate homes to sell quickly, and make lots of money doing it. "Ask, 'why not?' Almost everything we don't do has no good reason for it. Almost everything we don't do is the result of fear or inertia or a historical lack of someone asking, "Why not?'" You get a call from a prospective client who wants you to come over and look at her home and tell you what it will cost to stage it. Should you get paid for this? I don't go anywhere unless I'm being paid. In course 3, "Taking the Mystery out of a Home Staging Consultation" I describe at length how to avoid the 'F.r.e.e Estimate Trap' and turn a prospect into a paying client even before meeting in person! If you've got that frustrating feeling that something is holding you back from accomplishing your dreams, this might be just the book for you. It's really more like a kit or the grown up version of a flipbook, and it's a great tool to help you experience personal and professional breakthroughs. Don't want your own web site? If you don't have a domain name, or a web site and never intend to have your own, The Staging Diva Directory of Home Stagers is a perfect way to promote our talents with next to no effort on your part! You send me copy and photos and I build your page, create your links and boost your credibility! Building your own web site? Did you know that the fastest way to get your new site to appear in search engine rankings is to get a recognized high traffic site to link to you? You get this with a listing in the Staging Diva Directory of Home Stagers— saving the 3 to 6 month wait that's common for any new web site to be discovered. Have you already registered your own domain and when people go there, they see "under construction" or "domain is parked?" There goes a new client and they may never come back! I've created the Staging Diva Directory of Home Stagers to give you an EASY way to have an IMMEDIATE Internet presence. If you only got one project in a whole year, it would STILL pay for itself! How can you lose? Feeling isolated in your new business? The Staging Diva Network is an online discussion group for Graduates. It's a supportive community where you can share the joys and challenges of building your business. It's also a great place to have ongoing questions answered by both Debra Gould and your fellow graduates. You are receiving this monthly newsletter because you expressed interest in learning about the business of Home Staging. If you don't want to continue, use the "Unsubscribe" link at the very bottom of this email. I hope you find the content helpful; and I welcome any feedback! Debra Gould, President Six Elements Inc. There's no quicker way to build your credibility than to appear in the media as a home staging expert. Here I was interviewed live on Global TV Morning News. 1. Publicity is worth more to you than advertising. Publicity, or media coverage, is the best advertising that you can't buy, even if you could afford to pay for it! The audience gives more credibility and attention to content than advertising. So, it's important to include publicity as part of your marketing strategy. 2. Become less intimidated by remembering that THEY need YOU. Imagine what would have happened if I hadn't shown up that morning? 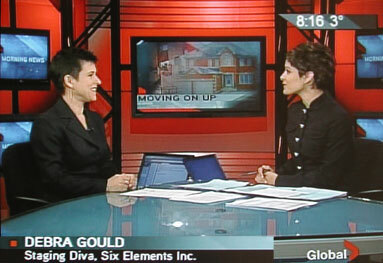 GlobalTV had promoted that there would be a staging professional on the morning news. They needed me to be there and they needed all the before and after photos I sent them in advance to help fill their newscast. Think of all the local papers and smaller stations that don't have big reporting budgets! They're looking for the content you can provide. 3. Remember the media are there to serve their audience not your business needs. You have a better chance of getting coverage if you present them with a story idea that has a built in "hook" or angle for the audience. Think about yours before writing any press releases, then make sure you send them to the right editors. Getting media coverage is only one of the many subjects I cover in course 4, "The Staging Diva's Sales and Marketing Secrets." If you haven't taken this Staging Diva course, you can order a recording of it right now for only $179. If you've already taken it, now is a great time to review your notes to ensure you get the media coverage you want during this spring real estate season. For more excellent PR tips, visit The Publicity Hound. Congratulations to Cindy Pickering of Sold With Style Home Staging who took what she learned in The Staging Diva Training Program and got featured in a local paper that's delivered to all the upscale gated communities in her area. Cindy's listing in the Staging Diva Directory of Home Stagers also nabbed a new project from a client who owns several investment properties— with future projects sure to follow. Congratulations to Lisa Allen on selling her own staged home in 4 days at 98% of asking. An excellent success story to use for her new business, Staged Rewards. Congratulations to Bernadette Broderick on her first client. The local media have begun to cover home staging and Bernadette writes, "I'm so glad I'm the only home stager in Quebec City, timing is everything!" Decoration Premiere Impression is also the first French listing in the Staging Diva Directory of Home Stagers. Congratulations to Dianna Leeder and Mary-Anne Stevenson of 2 Visions Home Staging who have a builder wanting them to stage a model home and provide color consultations to their buyers! Congratulations to Erin Rhindress who is juggling 6 clients in her new business. She's the same graduate who got her first project (a $5000 one!) introducing her company, ELR Designs, at a local networking event. The many low cost ways of networking and building awareness for your business are covered in course 4. I used these methods to grow my own staging company, Six Elements, to a considerable size in under 2 years, never placing an ad or even printing a brochure! Staging Diva Students and Graduates, send me your successes so we can celebrate your triumphs and inspire others! S.a.v.e. $25 on the new Color Guide! Have you been stumped flipping through a paint swatch book? Are you worried about quickly coming up with paint recommendations at your next client meeting? Take the guesswork out of trying to pick colors during a home staging consultation. I tell you the process I use to quickly develop a color palette for home staging that will appeal to homebuyers. I share specific color names and numbers for you to choose from. These are my favorite Benjamin Moore colors after doing hundreds of houses and seeing what colors work best under different lighting conditions. I explain sheen levels and recommend everything from color for walls, to trim, ceiling, basement floor, even the front door! 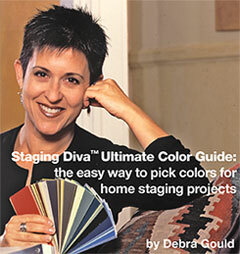 You can place an advance order for "Staging Diva™ Ultimate Color Guide: the easy way to pick colors for home staging projects" at the pre-release price of $50. When this ebook is available May 1, 2006, the price will be $75. If you order now at the pre-release price, I'll make sure you get your copy of the guide by email when it's ready May 1 and you'll s.a.v.e. $25! In addition to the GlobalTV Morning News feature, I'm featured in March and April issues of the Indianapolis Star, Center of The City Magazine, The Globe & Mail, Home & Decor and appeared on CityTV News at 6. I'm especially excited by the upcoming story on staging I wrote for The Official Pre-Mover Savings Guide. Coldwell Banker and Century 21 agents will distribute over 1 million copies to staging-ready homeowners throughout the US beginning this month. An excellent lead generator for Staging Diva Graduates! What does Staging Diva media attention mean for you? With more media exposure and more Internet traffic to http://www.sixelements.com/ and http://www.stagingdiva.com/, more people are educated about what staging can do; which makes your sales job easier. The value of your Staging Diva training increases because you can say that an internationally recognized home staging expert personally trained you. Traffic to your profile in The Staging Diva Directory of Home Stagers increases exponentially without you working to get this added exposure. And, you don't pay extra for it either! With every media appearance, I get calls from people looking for a home stager in their market. Just this week, I referred 13 projects to Staging Diva Graduates. 98% of the time, the Graduates who actually get work have a page on the Staging Diva Directory and/or their own website. It's rare for someone to hire a stager when they can't see samples of their work. Staging Diva and the Staging Diva Logo are trademarks of Six Elements Inc.
© 2005 - 2008 Six Elements Inc. All rights reserved. Republication or dissemination of this content is expressly prohibited without written permission.